The day of the baby shower has arrived. I was dreading it, but I actually enjoyed making a pair of booties and an appliquéd onesie for DH’s best friend. 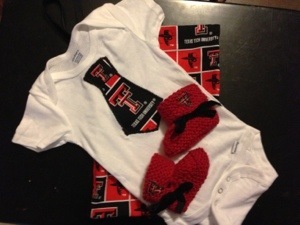 The expecting couple went to Texas Tech, so I put their logo on the booties I knitted and used logo fabric to make a necktie appliqué. Anyway, I got through making the gift, but I’m worried about the shower. DH’s mom is coming, but otherwise I’ll know only the mom-to-be. I’m sure it will be a day of invasive questions. I hope being prepared for the baby deluge will make it easier to handle. It’s better than being caught off guard. Categories: Finding Things to Be Thankful For, Fussing, Infertility | Tags: baby shower, booties, dread, infertility, onesies, Texas Tech | Permalink. Those gifts are adorable. Baby showers are never easy, but I think it does help that you can prepare yourself in advance. I hope it’s not too bad.